A web portal needs to have the right mix of technical functionality, aesthetic excellence, and interactive elements to stand out in terms of appearance, functionality, and structure. WeblinkIndia excels in the field of web portal development and offers flexible and reliable web portal development services to ensure your portal reflects your business idea. Covering diverse fields like real estate tour & travel, placement industry, e-commerce etc., we make e-cooperation among partners, customers, and clients seamless with our feature-rich web portals. The developers at this web portal development company develop B2B Portals that provide platforms for companies to engage in trade, promote their online presence, and engage in monetary transactions online. We create all-encompassing business directories as well as industry-specific portals depending on the required model. Online Classifieds have emerged as the perfect place for companies to get visibility, and for the customers to find desired products & services from a highly organized directory. For web portal development in India related to classified websites, we use the latest software and development platforms such as PHP, Java, Joomla, etc. More and more employers & recruitment agencies today are dependent on the Job Portal Database & Tools for acquiring the right talent/job options. Being an experienced Job Portal Development Company, we rely on the latest technologies for web portal design so that we can provide all the elements that can make for a successful, full-fledged Job Portal. Community Sites have evolved as a platform for businesses or entrepreneurs from same industry or similar field of work to interact for trading or non-trading purposes. Understanding the dynamics of Community-based websites or portals, the developers at weblinkindia.net, a leading web portal development company in India, create separate identity and structure based on the preferences of clients. Property Website Portal Development has become a lucrative venture with millions of property buyers and sellers turning to the internet to fund listings. Understanding this need, we provide the best solutions for web portal design and development as per the business needs of the clients. MESK Specialist Contracting Co. is a business development organization, specialized in providing top-notch services and solutions to the clients across different sectors. Our company base is located in Al Khobar, Saudi Arabia. Managed by a group of passionate individuals, we specialize in construction industry, industrial projects and expertise in the field of Automation, electrical, Instrumentation & Controls, fabrication, welding works, industrial chemical cleaning, steel structure fabrication, maintenance, heat exchanger maintenance, shutdown, etc. Our website is designed by a Delhi-based website development company named WeblinkIndia.Net Pvt. 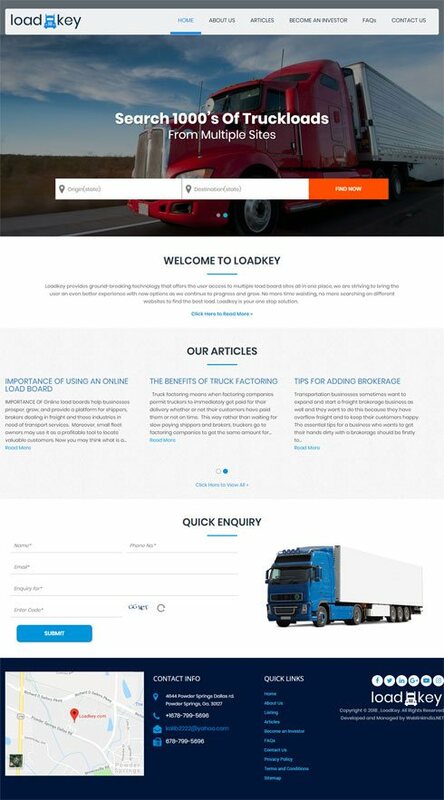 Ltd.
A premier name in the industry, LoadKey has been operating as a single window solution provider for all sorts of technical requirements. Our company base is located in Georgia, United States and we can be trusted for providing ground breaking and technologically advanced solutions that enable users to access multiple load board sites all in one place. Supported by a crew of talented individuals, we strive to provide an even better experience to the user with new options. To acquire more information about us and our operations, reach us through our website that is designed by WeblinkIndia.Net Pvt. Ltd.
Why You Need A Web Portal? Your Web portal serves as a platform for your customers to interact & engage with your business effectively. With Web portals, you get to manage various critical business operations through automating processes and integrating with third party systems. All the pages that transmit important user information are secured using SSL to assure that your clients can share important information safely, with confidence. The tools & frameworks with which we build our portals allow the clients to integrate permission based multi-user access with well-defined permission for each user group. Our web portals are built with well-established CMSs like Drupal, Joomla, and WordPress to offer seamless content management. Our productive web portal architecture ensures a website’s smooth performance, as the amount of simultaneous Web traffic or server load increases. Why Choose WeblinkIndia.Net For Web Portal Development?